If you already own this software then you might want to stick with what you've got but if not, what are you waiting for? 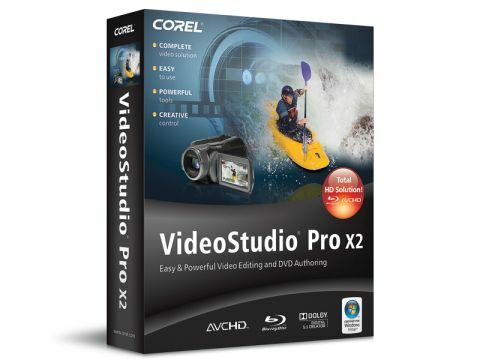 VideoStudio was originally launched under the Ulead brand, but in 2006 the name moved under the Corel umbrella, and has now been brought in line with other Corel products by adding the X2 suffix. Name changes aside, the basic engine and design of the package hasn't changed dramatically. It's a lengthy installation, especially if you decide to add all the extra tools that come with the package, such as WinDVD 9 Plus Blu-ray, DVD Copy 6 Plus and Steinberg WaveLab LE 6 Audio Editor. However, once installed you'll find everything you could ever need for editing and watching video. On the surface, not much has changed from the previous version, as the layout is still fairly standard. At first it may seem a little daunting, but the interface is conventional in approach, with a timeline along the footer of the screen and control boxes running along the top. Like Adobe Premiere Elements, if you don't want to worry about the editing process too much, you can opt for the Movie Wizard, or the DV to DVD Wizard, both of which help you get the best results using templates and very little knowledge. The results can feel a little staid, but it generally works well. However, if you really want to get to grips with the main interface, you'll find the central tasks are broken down into Capture, Edit, Effects, Overlay, Title and Share. When it comes to getting the best from this software, we found that importing video was simple, and rendering our edited footage was smoother and faster than in previous versions. You'll now find full support for HD formats, and you can even get the most from audio additions using the Surround Sound Mixer. At the other extreme, the addition of built-in YouTube uploading means you can compress clips and send them straight to your online account. While we didn't notice a marked increase in effects and extra tools in the core package of VideoStudio Pro X2 Ultimate, it still represents one of the most cutting-edge packages around.